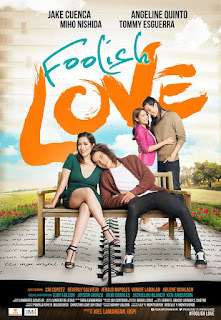 Foolish Love, a romantic-comedy movie, starred by Jake Cuenca and Angeline Quinto. 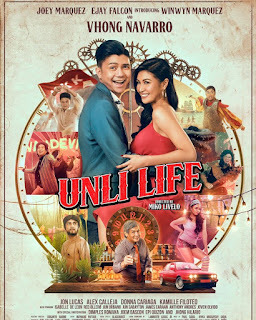 The movie was produced by Regal Entertainment Inc. with the direction of Joel Lamangan. A story describes three types of women when falling in love, first- the head over heels, second-the martyr and lastly- the hopeless romantic. Virgie (Angeline Quinto) the hopeless romantic, in her 30's is finding the love of her life named Reynaldo dela Cruz. Every man he dates ended up up a failure until he met the real Rey dela Cruz (Jake Cuenca) her childhood sweetheart. And they end up falling for each other. Another martyr love story of a mother of four, whose husband is cheating on her. Despite of this she kept strong for her children. And the last one, a love story of a sweet, fresh and young couples who was tested by misunderstanding and still they ended up together. A little daring approach in portraying of a love story which turns out to be funny and comical. Angeline Quinto again was a revelation in terms of acting skills. The movie also introduced a new love team with a great chemistry and looks good together. It is basically common story but the comedy is there. A thumbs up for this movie. For all hopeless romantic out there, I recommend you to watch this movie.